In the soon-to-be released version update, we plan to introduce "Group 2" abilities for the blue mage, corsair, and puppetmaster jobs. 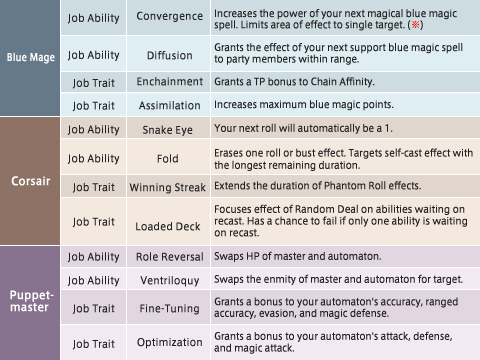 We will also be increasing the maximum limit for point allocation in the "Combat Skills" and "Magic Skills" merit point categories for all jobs. In the upcoming version update, we will be adding the "Group 2" merit point category for blue mages, corsairs, and puppetmasters. Each of these jobs will gain access to four new job abilities and traits that should prove invaluable in a variety of situations. See the tables below for a description of each ability. *Convergence will also increase the power of blue magic spells that are originally single target effects. The maximum limit for point allocation in the "Combat Skills" and "Magic Skills" merit point categories will be increased for all jobs. Further adjustments will be announced on the day of the version update.